The German Sanskrit philologist and teacher Gustav Oppert (1836?1908) worked for the greater part of his life in British India, as a professor in the Presidency College of Madras (now Chennai) and as a curator in the Government Oriental Manuscripts Library. This 1880 book considers, 'with special reference to gunpowder and firearms', the weaponry of the Hindu armies of the Middle Ages. Oppert uses two main sources, the Nitiprakasika and the Sukraniti, the former 'up to now, utterly unknown', the latter having never been 'properly described and published'. Unfortunately, the Sukraniti is now believed to be a nineteenth-century document (though drawing on older sources), and Oppert's claim that gunpowder was being used in India in the twelfth century is probably untenable. Nevertheless, the work remains an interesting study of the size, organisation and weapons of Hindu fighting forces, from bows and arrows to elephants, as well as the more anachronistic firearms. Preface; 1. On the weapons and war implements of the ancient Hindus; 2. On the authenticity of the Sukraniti; 3. On the use of gunpowder and firearms in general; 4. India the home of gunpowder and firearms; 5. 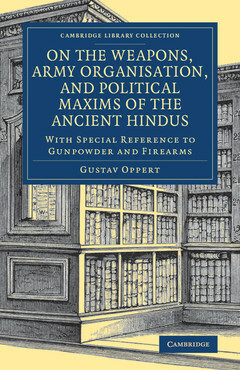 On the army organisation and political maxims of the ancient Hindus; Appendix; Index.